But that’s not all that will reawaken on December 6th. Ever wondered about the track’s humanity has left on other worlds? If so, you’ll probably appreciate this infographic from Karl Tate and Space.com. It’s a fairly intuitive image, so there’s not a lot I need to say. I’m jealous of the miles of tracks that were laid down by the Apollo astronauts in their moon buggies. Could you imagine? I hope to live long enough to see just as many human-driven miles on Mars. If video doesn’t load, please refresh this page. A sample of sand and dust scooped up on Sol 61 remains in the scoop. Plans to transfer it from the scoop into other chambers of the sample-processing device were postponed as a precaution during planning for Sol 62 after the small, bright object was detected in an image from the Mast Camera (Mastcam). 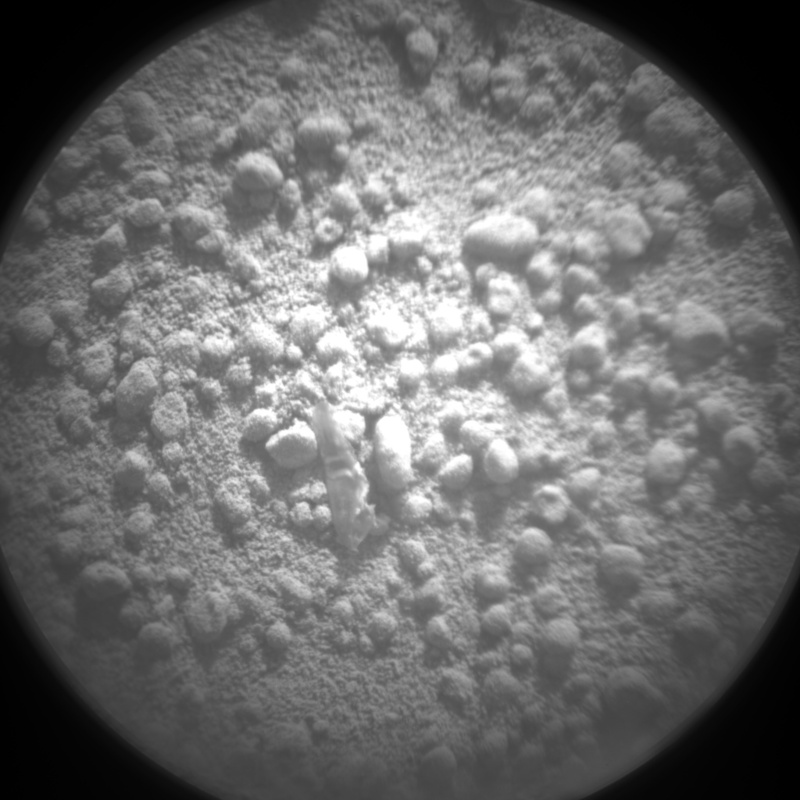 I still attest that Curiosity should zap the thing with ChemCam. 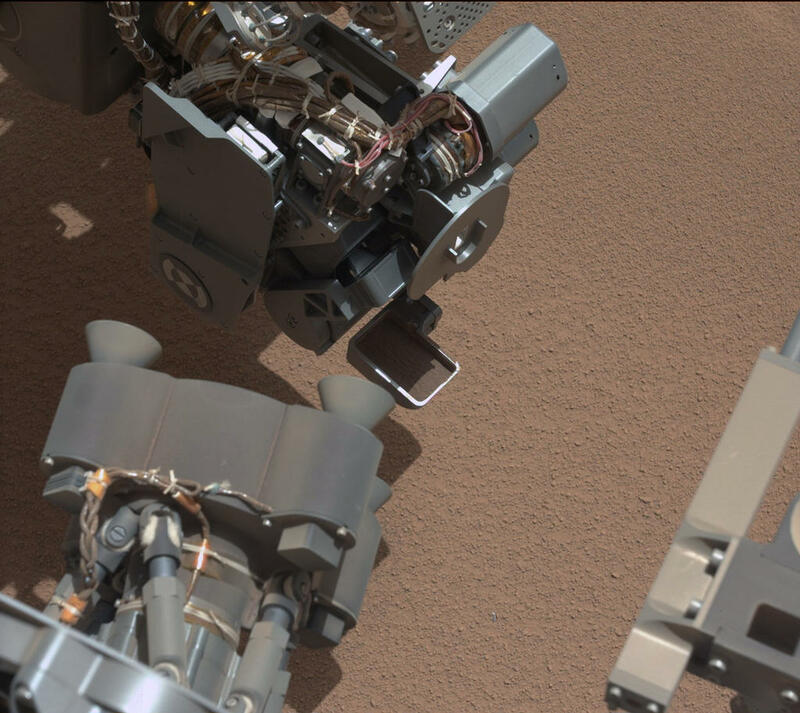 Today, Curiosity’s robotic arm reached down and scooped up its first sample of Martian dirt. Its cameras captured the historic moment, but caught something else too. There, among countless grains of reddish-orange sand, a single shimmering something caught the eyes of the image analysts back home on Earth. Curiosity’s first scooping activity appeared to go well on Oct. 7. Subsequently, the rover team decided to refrain from using the rover’s robotic arm on Oct. 8 due to the detection of a bright object on the ground that might be a piece from the rover. Instead of arm activities during the 62nd Martian day, or sol, of the mission, Curiosity is acquiring additional imaging of the object to aid the team in identifying the object and assessing possible impact, if any, to sampling activities. Hey, did you know that ChemCam also has a built-in laser? It totally does. The purpose of the instrument is to zap rocks with a laser while the camera images the resulting plasma created from the vaporized rock. It can then use the images to analyze the composition and other information about that rock. It’s my firm belief that Curiosity should zap whatever this unknown object is. For science! Exciting (and historic!) news came to the world via the space-front yesterday. A major announcement was made by Bellevue, Washington-based, entrepreneurial start-up, Planetary Resources. Yesterday morning, at Seattle’s Museum of Flight, they unveiled their plans — plans which up until now had existed primarily in the realm of science fiction: they intend to commercially explore and mine asteroids robotically. So who are Planetary Resources, and do they have the… well, planetary resources to pull off such a feat? Planetary Resources emerged from the cocoon of an organization, Arkyd Astronautics, which was founded in late-2010 by Dr. Peter Diamandis (spaceflight entrepreneur, founder of the X Prize Foundation) and Eric Anderson (founder of the commercial spaceflight/space tourism corporation, Space Adventures). If not there at the start-up, Chris Lewicki (a former NASA Mars Phoenix Lander mission manager) quickly came on board as president and chief engineer. They began very quietly, offering employment for engineers and other professionals and presenting themselves as devoted to developing “disruptive technologies for the commercial robotic exploration of space”. Google’s Larry Page & Eric Schmidt, Ph.D.; film maker & explorer James Cameron; Chairman of Intentional Software Corporation and Microsoft’s former Chief Software Architect Charles Simonyi, Ph.D.; Founder of Sherpalo and Google Board of Directors founding member K. Ram Shriram; and Chairman of Hillwood and The Perot Group Ross Perot, Jr. If there is a group of people with the potential, background, and resources to make this venture a reality, I think we’re looking at it. So what’s the plan here; plop some robotic miners on an asteroid, bring home a lode of precious metals, and sell it for profit? Yes and no. They claim their primary purpose is based on their vision, not a return on investment. That said, the potential return on investment is huge, even if it takes one heck of an initial investment to get to that point. If that claimed motivation is truly the case, I have extremely high hopes for Planetary Resources. The greatest breakthroughs and advancements, those technological leaps that change our world, generally don’t emerge out of a profit-plan. They bloom from inspiration and a yearning to do big things, to follow one’s passions wherever they might take them, no matter the cost. This venture can afford to follow those dreams. And while they will face many challenges along the way, as long as they stay motivated by their vision I don’t foresee them limited into accomplishing it. They will begin by launching and deploying a number of small space telescopes — already developed under the Arkyd name — that will find, observe, and characterize near-Earth asteroids (NEOs, Near Earth Objects). The first of these is slated to go up within the next 24 months. 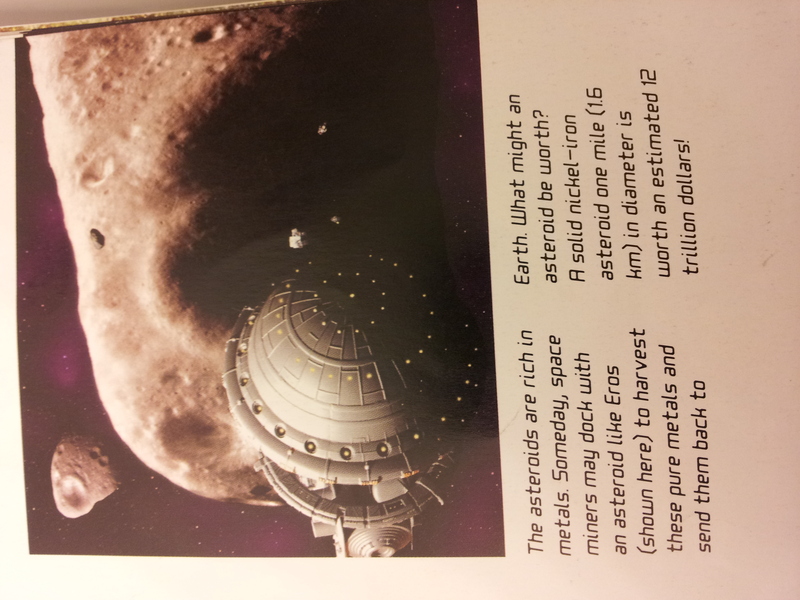 Once asteroid targets have been selected, probes will be sent to them to begin mining operations. Interestingly, their first mining goal won’t be to see what precious metals they can extract; their first targeted material will be water and other materials that can be used as supplies in space operations (oxygen, nitrogen, etc.). When you consider the costs of launching supplies from Earth into space, it’s overwhelming. During the historic press conference, former NASA astronaut and Planetary Resources adviser, Tom Jones, pointed out that carrying a single liter of water to the International Space Station costs approximately $20,000 USD! With such tremendous shipping costs, there’s little difference in the cost of putting a kilogram of gold or a liter of water into space — virtually all of the cost is fuel to get into orbit. So with that idea, turning asteroids into supply depots would be extremely valuable, and drastically reduce the cost of space programs. This will also allow Planetary Resources, and other companies that might emerge between now and then, the opportunity to extract other natural resources to return to Earth. Asteroids hold the potential to make some of Earth’s rarest materials abundant, and acquiring them for use on Earth could rapidly transform our technology and infrastructure. If you want to delve deeper into the hows and technical details of the project, you can check out the FAQ on Planetary Resources’s website and watch the archived webcast of their groundbreaking press conference. Again, I feel highly inspired by all of this. I feel extremely lucky to live in a time when exciting things like this begin to grow legs (I hope things move quickly enough that I will live to see humans exist as a true space-faring species). The challenges will be immense, and I don’t even want to consider the up-front economics involved, but I believe now is the time to take this step forward — and whatever Planetary Resources undertakes and no matter how far they go, we’re headed in the right direction. In addition to all of the data and images sent back, however, those two Pioneers also sent back a mystery. As early as 1980, it was noticed that the spacecrafts were experiencing an acceleration force toward the sun of .000000000874 m/s2 (meters per second, per second)1. To be clear, this does not mean the Pioneers are heading back towards the Sun. 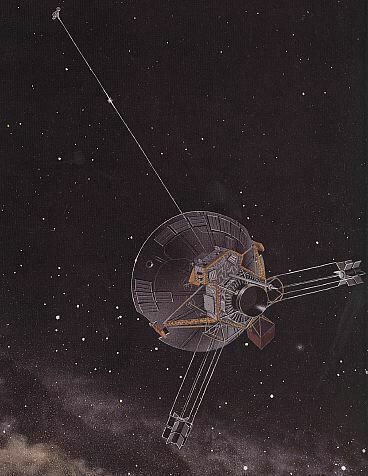 Pioneer 10 and 11 are cruising away from the Sun at a speed of around 132,000 kilometers per hour (82,000 miles per hour) and 175,000 kilometers (110,000 miles per hour), respectively, and this force is 10 billion times smaller than the acceleration we feel from the Earth’s gravitational pull. Nonetheless, the force is real and our instruments and techniques are precise enough to notice. perturbations from the gravitational attraction of planets and smaller bodies in the solar system; radiation pressure, the tiny transfer of momentum when photons impact the spacecraft; general relativity; interactions between the solar wind and the spacecraft; possible corruption to the radio Doppler data; wobbles and other changes in Earth’s rotation; outgassing or thermal radiation from the spacecraft; and the possible influence of non-ordinary or dark matter. In 1994, a thorough, long-term, collaborative study was undertaken to try and solve the anomaly. Initial results from that study were released in 1998, with a detailed analysis following in 2002. All known systematics were tested and calculated, yet that 8.74±1.33×10−10 m/s2 deceleration force2 remained. The origin of the anomaly was still unaccounted for, though the leading theory was that it was the result of anisotropic thermal radiation (don’t let the big words intimidate you, this just means heat was being radiated from the Pioneers in a certain direction). In 2004, another paper was published, proposing a deep space mission to solve the anomaly once-and-for-all. Think of what you would have to go through if I handed you a 5.25″ floppy disk that contained… well, it couldn’t contain much compared to the amount of data we exchange today, but whatever it was, it was something you needed. Imagine trying to find the hardware to read the disk, and then the intermediary hardware and software that would be required to get the data from the disk onto one of today’s modern machines so you could even utilize it. If you consider how much technology has changed between now and floppy disks, you can only begin to imagine how much it has changed since the 1970s and how cumbersome compiling all of this data, let alone securing it, must have been. I digress. Why was the thermal emission from the spacecraft anisotropic and slowing the spacecraft down? First of all, because the Pioneer spacecraft were spin-stabilized and almost always pointed their big dishes towards Earth. Second of all, because two sources of thermal radiation (heat) were then on the leading side of the spacecraft. The nuclear power sources, more formally Radioisotope Thermoelectric Generators (RTG), emitted heat towards the back side of the dishes. When the dishes reflected or re-radiated this heat, it went in the direction of travel of the spacecraft. Also, the warm electronics box for the spacecraft was on the leading side of the spacecraft, causing more heat to spill that direction. Photon pressure, the same type of thing used in solar sailing, then preferentially pushed against the direction of travel, causing a tiny, but measurable, deceleration of the spacecraft – the Pioneer Anomaly. At the end of the day, there are a few take-home lessons to be learned. First, Occam’s Razor proved itself once again (some of the suggestions to account for the Pioneer Anomaly were the need to invoke a new type of exotic physics). The second is that you can’t just apply Occam’s Razor and say that anisotropic thermal radiation is the simplest theory and therefore correct, you have to painstakingly collect all of the data needed to prove it — and more importantly, you have to have the experts that are willing to put forth the years decades of research to solve the mystery. Finally, you take in the account that this was made possible with the help of citizen scientists and those of us that contribute to furthering our understanding of the Universe, through means such as The Planetary Society4. This new paper will undoubtedly generate more discussion about the Pioneer Anomaly and others will work to verify or disprove its results, but at this point it seems pretty safe to say that one of space physic’s mysteries is no more. Even though there’s still just under five months remaining until the Mars Science Laboratory Curiosity rover lands on Mars’ surface, I almost find myself counting down the days. I woke up early to watch the launch of MSL live on NASA-TV last November and have followed the updates on its progress since then. One of the neat features you can find on the MSL website is the “Where Is Curiosity?” page, where simulated views of its progress from Earth to Mars are updated daily over its 36-week journey. Watching the slight change in the images from day to day gave me an idea: these images could be made into a cool animation! So I hopped over to the Jet Propulsion Laboratory/California Institute of Technology’s Solar System Simulator website, fiddled around with the various options, and then started collecting images for each day that the mission has been elapsed up until today. I put them together into a little video, added some music, and now I offer it to you for your interplanetary enjoyment. In the top left, you can watch the days tick by. The MSL is labeled in green in the center of the video. If you’re interested in reading some of the details related to distance traveled and the speed of the craft, you’ll want to watch the video in HD and full-screen. You’ll probably notice that around 14 seconds into the video (specifically, beginning with the frame for January 14), the perspective changes slightly. I’m not exactly sure what causes it, but its the way the simulator changed the images it spit out starting with that date. I’m going to contact the designer with JPL/Caltech and see if they can help me out with different perspectives. I hope to update it from time-to-time between now and August, to put Curiosity’s progress in perspective.